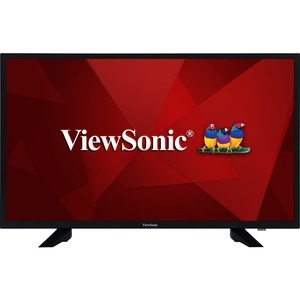 Marketing Information: The ViewSonic CDE3204 is a great value, high performance 32'' (31.5" viewable) Full HD LED commercial display for hotel, restaurant and hospitality environments. In addition to versatile connectivity options, including HDMI, HDMI/MHL, VGA, DVI, SPDIF, YPbPr, the display comes with a simple and convenient USB multimedia playback functionality. With 1920 x 1080 resolution, 320-nit brightness, wide viewing angles and dual 10W stereo speakers, the slim-bezel CDE3204 delivers vivid images and remarkable sound for superior multimedia performance. The HDMI CEC pass-through support provides one-touch-play, with additional features for multiple connected devices such as HD set-top-boxes, media players, and Blu-ray™ players. An RS232 port with IR pass-through provides automated control for hospitality installation. Creating a more comfortable viewing experience, the display is equipped with Flicker-Free and Blue Light Filter technologies. In addition, free-bundled vController software offers easy maintenance and intuitive interfaces for remote management via a PC server or laptop.